The Meyers House, erected in 1897, is an example of the Colonial Revival style, which was popular around the turn of the century. The home is situated on 3 city lots, and features the original fencing and pergola, three car garage, carriage house, and an architectural studio built in 1935. 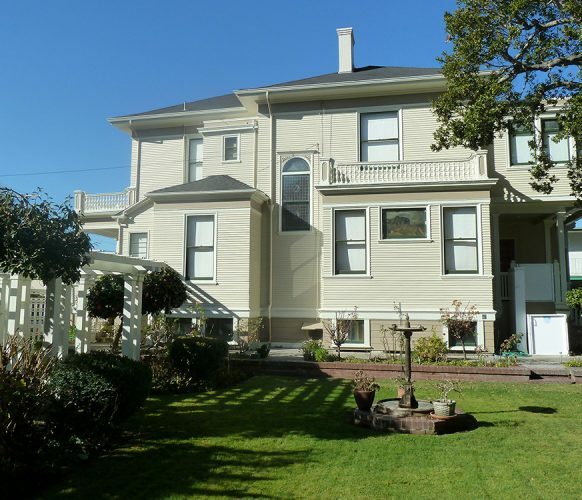 The three Meyers sisters originally bequeathed the house and grounds to the City of Alameda for use as a house museum and a passive park. 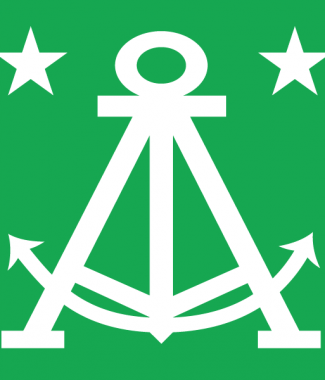 On May 1, 2013 the City transferred operations and ownership to Alameda Museum. 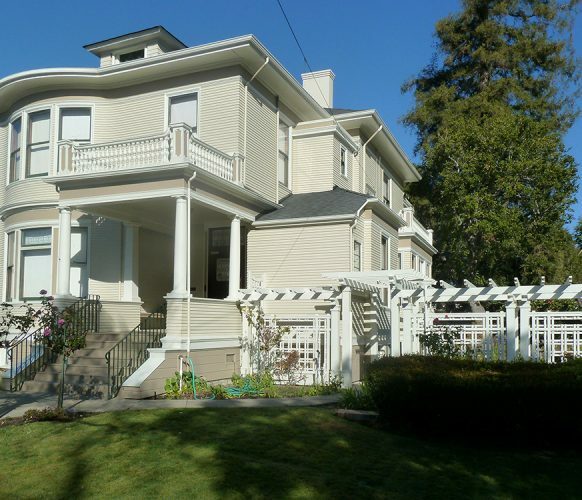 The House is a City of Alameda Landmark, designated Historical Monument Number 26. 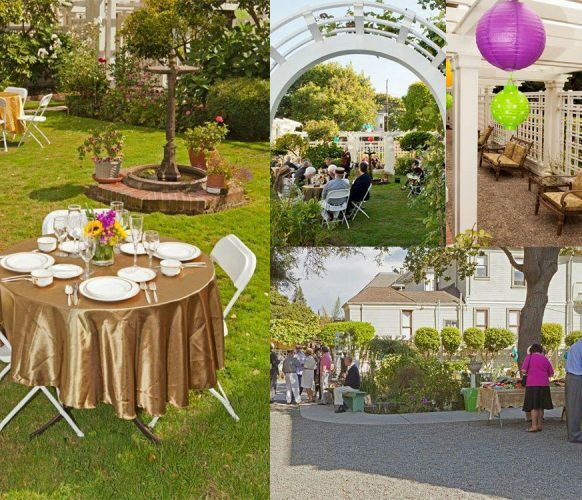 Located on a tree-lined residential street in the bayside town of Alameda, the grounds of the Meyers House offer a beautiful and unique period venue to visit. The house is also available for private group tours. The Meyers House is open each month on the fourth Saturday from 1-4PM. 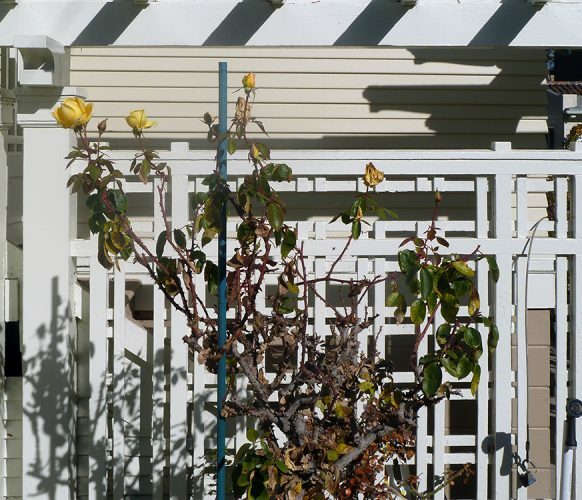 Your $5 admission includes a docent tour of the Meyers House Museum, a visit to a large display of Alameda house styles and details, and a glimpse into Henry Meyer’s architectural studio. The Meyers House, erected in 1897, is an example of Colonial Revival, an architectural style popular around the turn of the century. Designed by Henry H. Meyers, the house was built by his father, Jacob Meyers, at a cost of $4,000. 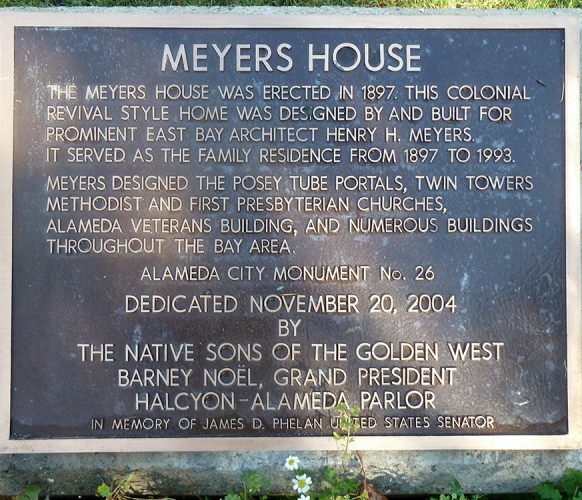 Mr. Meyers was a prominent East Bay architect who received many Alameda County commissions. His work includes the portal entrance of the Posey Tube in Alameda, ten veterans buildings throughout Alameda County, and numerous public buildings and churches. In 1894 he married Bertha May, whose father was a prominent rancher in Alvarado, California. The couple had three daughters. Edith (1900-1971) was a physician, Mildred (1898-1982) practiced as an architect, and Jeanette (1905-93) ran their Dry Creek Ranch near Union City. Mr Meyers died in 1943, followed by his wife in 1947. 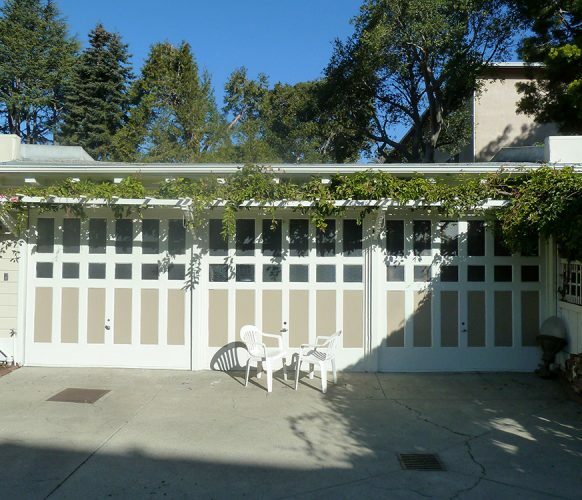 The home is situated on a three-parcel lot, that includes the original fencing and pergola, three-car garage, and an architectural studio built in 1935. The Meyers House has received numerous additions, designed by Mildred Meyers, a practicing architect. 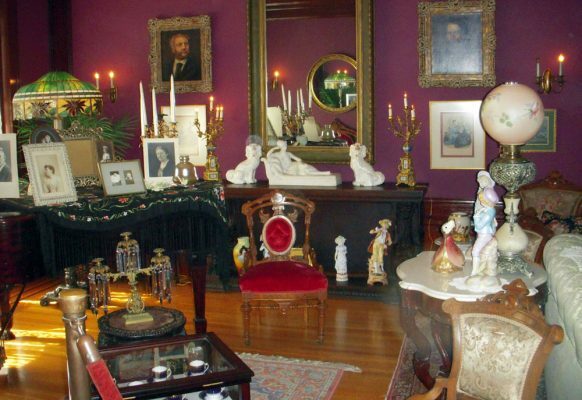 The living room is furnished with many objects that originally belonged to the Meyers family including the Steinway & Sons piano, oriental carpet, four reception chairs and kidney shaped couch. What is now the living room was originally two separate rooms, a parlor, and a sitting room. The wall separating the two rooms was removed in 1915 when the curly redwood fireplace, wainscoting, and triple cornice were added. The hardwood floors with feature strips were also laid during this period. 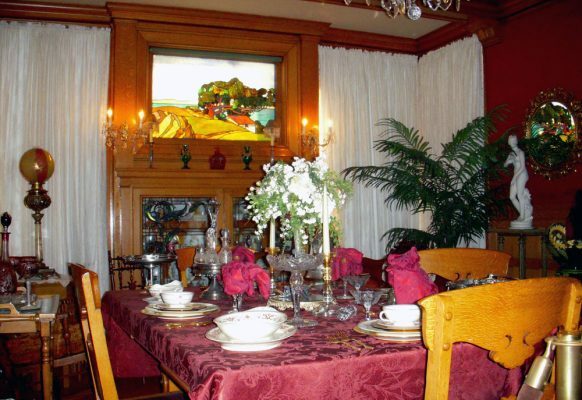 An oak table, four chairs, lamp table, and tea cart were part of the Meyers family furnishings. The molding, wainscot, and built-in side board in quarter-sawn oak are also original. The stained glass window depicting a Monterey, California scene was added in 1909. The kitchen contains a 1930s Wedgwood stove, a drop-leaf table, four chairs and a high chair that originally belonged to the Meyers’ family. 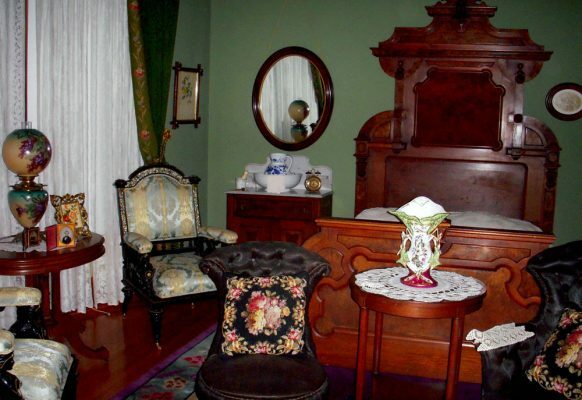 The three piece Victorian bedroom set, plus additional pictures and bric-a-brac, are original to the Meyers house. 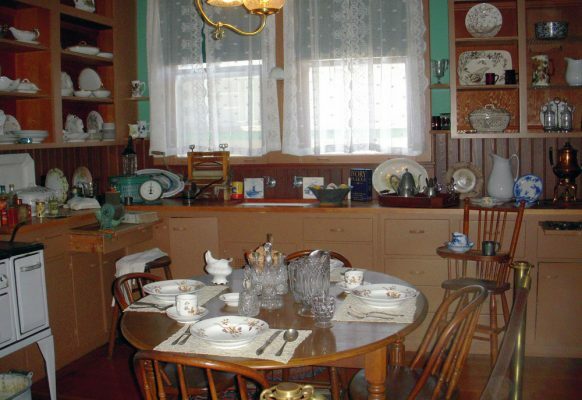 Most of the furnishings and objects found in the home have been graciously donated by the public or are from the Alameda Museum Collection. Some rooms, including the dining room and master bedroom have been painted to replicate the original colors. 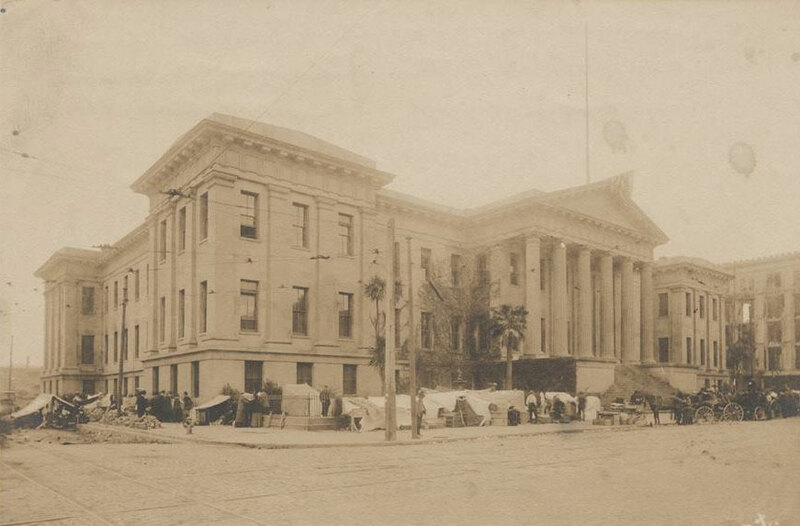 Once the 3 car garage, designed by Henry H. Meyers and constructed between 1916-1917, the area was transformed into an exhibit area featuring architectural artifacts from the Museum’s collection in 2009. Some of these objects, never before exhibited, include doors, hardware, light fixtures, stained glass windows, etc., removed from Alameda buildings, some now demolished. 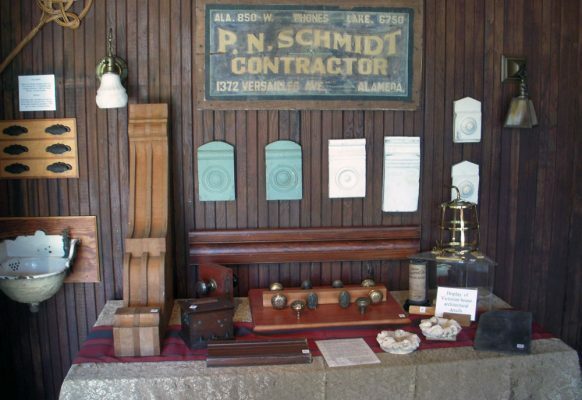 The exhibit illustrates the decorative details that were utilized on such mundane items as door hinges and gas jets. They represent the period of their use and the evolution of taste and design.